In the first part of this article, we explored systems and created a causal loop diagram (CLD). In this article, we're going to look at the basic behaviours of systems. If we want to solve a problem or influence outcomes, we need to understand why the system is behaving as it is. Archetypes are a classification of systems behaviour. They give us a relatively easy tool to spot and forecast behaviour and develop a response plan for instituting changes to meet objectives. Archetypes were first identified in the 1930s by biologist Ludwig von Bertalanffy¹ and expanded by Peter Senge in his books The Fifth Dimension² and The Fifth Discipline Fieldbook³. What we might find surprising is that there are only 16 unique archetypes, and in part one of this article, we've already encountered the two that are the basis of all the remaining 14, the balancing loop and reinforcing loops. All of the other archetypes are combinations of these two structures. Since balancing loops restrict effects, archetypes primarily based on them can help us solve problems, and because reinforcing loops promote behaviours or effects, archetypes based on them help us promote desired states. 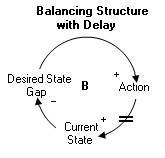 One of the two fundamental structures in systems thinking, a Balancing Structure represents an objective not yet met, referred to as a gap between the current state and a desired state. We should realise that the desired state may not be human-driven (and may even be at cross purposes from our objectives) because it's being driven by the system itself in its drive towards equilibrium. Strategy: First, the objective and current state must be known because they drive the gap. The existence of the gap is a motivator, so the larger the gap is the greater it serves as a motivator. One caveat is that the objective must be reachable, otherwise it will not motivate. Also, as the gap decreases, its ability to serve as a motivator decreases, so alternative methods of motivation need to be instituted. Hypothetical example: A project sponsor needs to reduce the cost of a project by $10,000. A desired state has been established, being the current cost minus $10,000. The gap is the difference between the current state and the desired state, and while this gap exists, it will drive actions to reach the desired cost. Once the project cost has been reduced by $10,000, the gap will no longer exist and it'll no longer motivate further actions. It's very common for there to be one or more delays in balancing loops. For example, there's usually a delay after a change is introduced and before it starts having a visible effect. Delays often cause us to think the change was ineffective, so we increase the amount of change, thereby overcompensating and causing unintentional side effects or throwing the system out of balance. Strategy: If a change doesn't seem to be having the desired effect, it's best to first investigate whether there's a delay involved, and if so, exhibit some patience before deciding to make further changes. It's dangerous to introduce more changes in an effort "just to do something" than to allow a short period of waiting to see what effect the prior changes have. 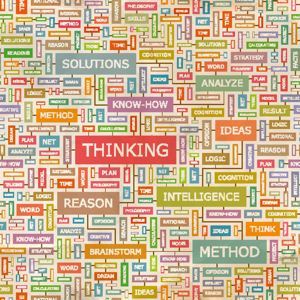 Hypothetical example: A business analyst is implementing a change that will improve the efficiency of a process. However, because of production that is already underway, it will take several days for the effect of the changes to be seen and measured. If the business analyst introduces more changes before waiting for the delay to expire, the system could be thrown into chaos. Indecision results from two balancing loops with delays, so that by the time one loop reaches its target, the second loop's target has moved, affecting another change in the first loop. But because the two loops never reach the target together, the goal constantly moves and is never reached. Strategy: Indecision stems from our inability to pin down the current value in both loops at the same point in time because of the delays. The best approach is to base decisions not on the current value but instead on estimates of the future values at the same point in time for both loops. Hypothetical example: A procurement manager needs to contract for a bulk purchase of construction materials. However, he's seeing signs in the market that the price for the materials is on a downward trend, so he decides to wait until the price decreases to X. However, other companies are spurred by the lower price and begin buying up the materials, which after some delay, drive the price back up. When the procurement manager realises this, the price has already exceeded X, so he tells himself he'll buy when the price reaches Y. But the higher prices now cause demand for the materials to decrease, resulting in a downward price trend below Y. Seeing the downward cycle, the procurement manager again decides to wait until the price decreases to X before he buys. 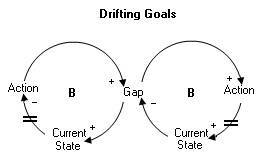 Drifting Goals occurs when two balancing loops interact in such a way that the activity from one loop serves to undermine the balance or goal the other loop seeks, affecting it to strive for a new state, which may not be the original state desired. 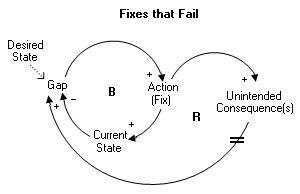 Strategy: Some manner of corrective action is be needed to keep the two loops from interacting. The temptation might be to reduce the original desired state to a more achievable level; however, this is actually eroding the original objective. A better solution is to find out the factors prohibiting the gap from being closed and addressing those. Hypothetical example: In one of our earlier examples, the project sponsor wanted to reduce the project cost by $10,000. Let's consider that she was able to find $8,000 in savings, but the last bit of cost reduction is becoming difficult for her to reach. Since the $10,000 gap is now only $2,000, it's less of a motivator, and the difficulty in finding another $2,000 in savings is now increasing her willingness to accept the $8,000 savings as an adequate goal. 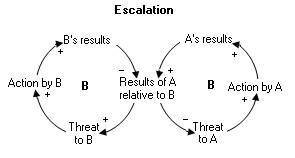 Escalation is two balancing loops that feed each other and act as a single reinforcing loop. The action occurring in one loop results in an increased action in the second loop, which itself causes an escalation of actions back in the first loop. While this may sound like simple competition, it's likely that escalation will reach a point where it threatens the success of both parties because it's too costly by diverting resources from productive efforts. Strategy: The most effective approach is to find a way to disconnect the two loops or find a way to make the two loops successful only through co-operative results instead of measuring success of the loops in relationship to each other. Hypothetical example: In an effort to encourage motivation through recognition, a manager has set up weekly awards based on productivity between dependent groups on a project team. Initially, the awards raise productivity and are viewed good-naturedly. But as time goes on, some people take them much more seriously and begin withholding key information from the other group, causing it to miss productivity goals. In turn that group retaliates by also withholding information, sabotaging the success of the first group. As the cycle progresses, the success of the project is in jeopardy. The Fixes that Fail archetype results in a problem that keeps resurfacing after it appeared to be solved. This is normally due to unintended consequences of the solution that undermining the results. It's caused by a balancing loop's action serving to create a second reinforcing loop, whose results have an opposite effect on the balancing loop's gap. This relationship is compounded by a time delay in the reinforcing loop, so it may not be obvious for some time that unintended consequences are undermining the efforts of the balancing loop. 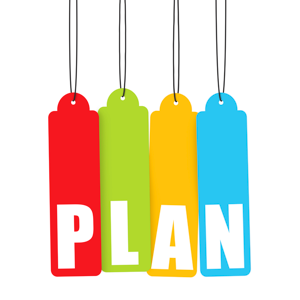 Strategy: Since unintended consequences are difficult to uncover, the only effective strategy is planning and analysis ahead of time to make sure all potential causes-and-effects of a probable solution are investigated. Even when that is done, vigilance and monitoring are necessary to make sure that nothing unseen is undermining the solution's actions or effects. Hypothetical example: In order to meet a production quota that is behind, a manager requires his team to work additional hours. In the short-term, production increases, but as the team's energy level and focus diminish, its attention to detail decreases and quality problems show up in the output. The quality problems result in additional post-production work to fix, which cause productivity to diminish and the quota to be missed. Shifting the Burden results in fixes that only exasperate the core problem over time. It's caused by focusing on a symptomatic, short-term solution rather than addressing the root cause. It is pictured as two balancing loops reacting in a way that undermine each other with a delayed reinforcing loop making the problem reappear later, usually with results that are worse than they originally were. Strategy: The draw towards a symptomatic solution is easy to fall into because it's usually quicker and cheaper in the short-term. So the key is first knowing whether the problem being addressed is symptomatic or fundamental, and then addressing the root problem with a solid solution, particularly watching out for any side effects. However, urgency may dictate a two-pronged solution, one aspect dealing with the immediate symptoms and a second dealing with the longer-term problem. Hypothetical example: One aspect of a project required analysis of marketing data, which was obtained from a research company. After several weeks of efforts, an analyst on the project team found that a lot of the cities and postal codes didn't match. The analyst quickly solved the problem by running an update on the data using the city to get the correct postal code. Since the problem appeared solved, the analyst didn't look any further to see what could have caused the mismatch. However, much later in the project, it turned out that the root cause wasn't the postal codes, but that the data from multiple sources wasn't properly merged from the start and was entirely incorrect. 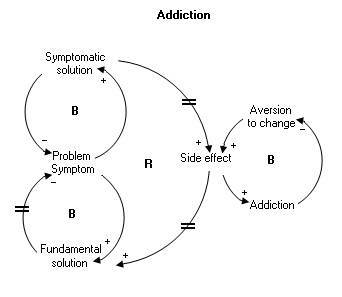 Addiction is a Shifting the Burden archetype, but with an evolving reliance on the side effects the symptomatic solution causes. This reliance on the symptomatic solution makes it even harder to address the fundamental problem. 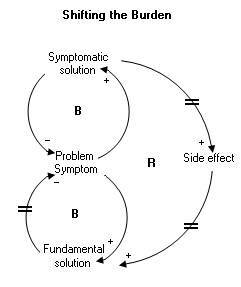 Strategy: The additional challenge with addiction is that the shifting-the-burden cycle cannot be broken without also severing the addiction cycle. Hypothetical example: An insufficient focus on quality has resulted in a software application that is prone to installation errors. In its initial implementation and the resulting barrage of help desk calls, the product team vows to address the problems in a second release. Over time, the help desk becomes very efficient at handling callers with installation problems. As the product team prioritises items for the second version, the urgency of fixing the installation problems decreases and neither the installation issues nor the core quality management issue gets addressed. A Reinforcing Structure is one of the two fundamental structures. It serves to promote an effect or action, and a good example is a savings account in which the interest earned is added to the principal, which itself earns more interest, which adds to the principal, and the cycle repeats. Strategy: Reinforcing structures can be negative if they promote an undesirable state or positive if they achieve a desired state. In a negative situation, the best course is to break the loop so that it can no longer feed upon itself. One might think that a positive reinforcing loop is good and should be left alone; however, there are always limits to growth, and a reinforcing cycle will not go on unchecked forever (refer to Limits to Growth). The best strategy is vigilance, monitoring, and management of the inevitable balancing loops that will come into play but which may not yet be obvious. Hypothetical example: The lessons-learned process can be a positive reinforcing structure. 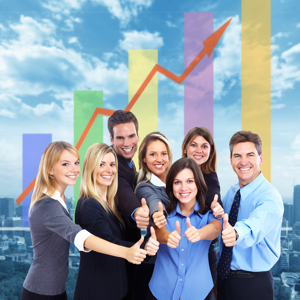 As lessons learned from prior projects are put into practice, the project teams see the beneficial results. This motivates the teams to collect and document more lessons learned, adding to the organisation's collection of knowledge and making it more useful. The larger the lessons-learned library becomes, the more it's used and the more benefits other project teams reap, making them greater believers in the lessons learned process, so the cycle builds upon its own success. 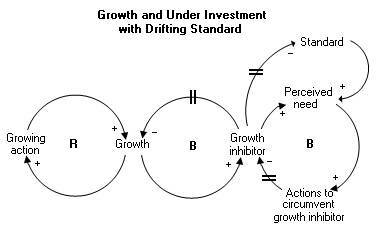 A Limits to Growth archetype is very common, and it's evident by a change in the predicted behaviour of a system, such as a growth pattern stopping. 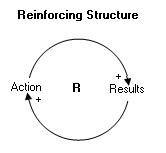 This change in behaviour is caused by a balancing loop that is restricting the reinforcing loop from reaching a goal. Strategy: We need to always remember that growth as the system is currently defined is finite. We need to anticipate what limitations will come into play, and monitor and manage the system to reduce the limitation's impact or change the system so that it's not reliant on a single, limited resource. Hypothetical example: In order to crash a project, a manager has asked the project team to devote 10% more hours to a project each week. Initially, this is done and the project's duration decreases; however, this reinforcing loop will eventually encounter the limits to the hours available, the team cannot infinitely increase its hours by 10% each week. When this balancing loop begins to kick in (perhaps at different times for different people), the duration's rate of decrease slows down and may actually begin to increase as the team wears down. 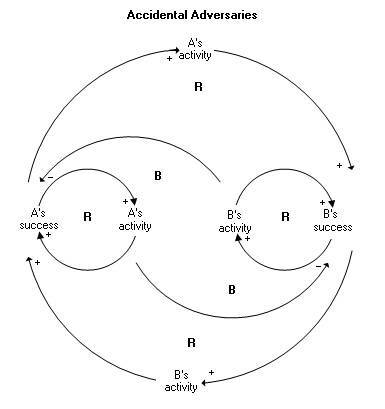 Accidental Adversaries results in a situation where two dependent loops, originally achieving beneficial and successful results, eventually limit the growth of the overall system because one loop's success begins to undercut the other loop's success. And since the two loops are dependent, the lowered success of any loop will lower the success of the dependent loop. Strategy: Accidental adversaries usually starts out with the best of intentions. It's a co-operative relationship where A's actions benefit both A and B, and B's actions benefit both B and A. The problem arises when in order to achieve more individual success, A's actions start having a limiting effect on B's success, and B's actions start limiting A's success. So the strategy is to eliminate the drivers that are causing A and B to improve individual successes at the expense of the overall system's success, or break the co-operative relationship between A and B and letting individual successes drive the system's growth. Hypothetical example: The customer is offering an early-completion bonus on a project. As an incentive, the project manager has devised an award mechanism for the project team by creating incentives for groups based on how they're able to reduce durations by. The manager hopes this makes for more co-operation, and initially it does. However, the software development group begins cutting corners, which greatly reduces its durations, creating more success for them. The problem stemming from this is that because of faulty software deliverables, the quality team has to spend more time identifying problems, resulting in a backlog. With the added work, the quality team can't rapidly sign off on software components needed by the developers for them to continue their work, undercutting their success. The behaviour evident in a Success to the Successful is that limited resources are allocated to the profitable, lucrative, or better performing party, leaving scant resources for another party perceived as being underperforming. And without adequate resources, the underperforming party can't achieve its goals. Which party is viewed as more "successful" and thereby gets more resources can be based on subjective data, creating a self-fulfilling prophecy. Strategy: If possible, the best strategy is to expand the scarce resource so that there isn't contention. But if that can't be done, then the objective allocation of resources based on strategic needs is better. Objective allocation can only be done if measures and strategic objectives can be defined. Hypothetical example: A company has only a limited amount of capital to allocate to two different projects. One will be led by a senior manager and the second by a manager who's new to the company. The new manager is seen as being less competent, so his project is given less funding than it needs even though it's more important to the organisation. Without adequate funding, the new manager's project is not successful while the senior manager's project is completed since she had the necessary money. This outcome reinforces the perception that the new manager isn't experienced enough. Tragedy of the Commons occurs when only a finite amount of resources are available that are allocated on a first-come, first-serve basis. As long as the resources are adequate, all parties are successful, but as the resource get scarcer, the allocation is often based on who figures out how to work the system best. 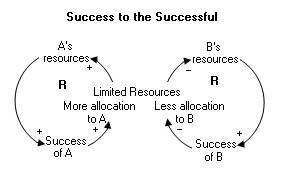 This is also known as an "All for One and None for All" scenario because in the end nobody is successful once the resource is depleted. It is two reinforcing loops with two corresponding balancing loops. Strategy: Use of alternate resources is an effective option because it increases the available pool of the resource, though this may just delay the day of reckoning. 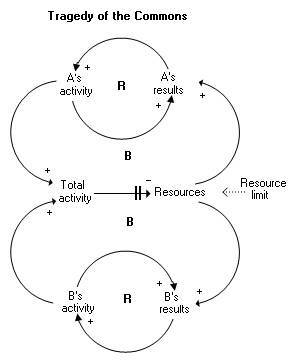 But if the resource availability can't be increased then feedback needs introduced into A's and B's individual results to encourage better use of the resource. Hypothetical example: On a fixed fee basis, a consultant is assisting a project team on several different project deliverables headed by different groups from the customer's organisation. Each group is primarily concerned with its own success, and since the consultant's time is essentially free (because it's a fixed fee contract), they're using as much of the consultant's time as needed. But as each group takes up more of the consultant's time, she can no longer help them equally. 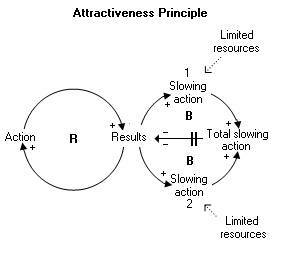 The Attractiveness Principle is a variation of the Limits to Growth, but it involves restrictions on growth due to multiple limits that can't be dealt with equally or at the same time, so choices must be made as to which limiting factors can be addressed. 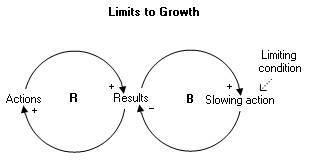 It is two balancing limits with the growth restrictions and a reinforcing loop that's producing results. Strategy: Knowing that the growth restrictions exist and what they are is the first step, even if they're not currently visibly slowing growth. That knowledge can help us circumvent the growth restrictions, such as replacing the limited resource with an alternate source. It's likely that not all restrictions can be addressed at the same time or equally, so choices and trade-offs will have to be made. Hypothetical example: A number of risks have occurred on a project, and these have negatively impacted the project's scope, quality, schedule, and cost. There has been a loss of some key personnel on the team, construction challenges that were not originally anticipated, and change in the economic environment. In order to get the project back on track, the project management team has to determine how best to allocate its limited personnel and money to tackle several problems. Since it's not likely that all problems can be effectively addressed with these fewer resources, the team is going to have to make choices. The Growth and Underinvestment is another derivative of Limits to Growth, but it includes two balancing loops that collectively serve as a reinforcing loop to restrict growth. It usually evident because of a desire to keep capital investment low. Strategy: Advance planning and prompt action can help. Realising what factors will inhibit growth is the first step. This includes the growth inhibitor factor, which may be difficult to change because it's usually based on an objective such as keeping profits high or not adding unnecessary overhead. If there's a time delay between increasing growth capacity and when it'll take effect, actions need taken ahead of time, not after it's too late because demand may never return. Hypothetical example: Two skilled chefs started a catering business. Initially, the demand is low and the two are able to provide excellent service. Word begins to spread about their excellent food, reasonable prices, and attentive service, so they have more customers. But, they are reluctant to add more people, and as they take on more clients, the two of them can't offer the same level of high quality to the larger number of customers, and as their quality falls, demand drops back down. This is a variation of the Growth and Underinvestment, but within this archetype, behaviour causes the standard to subtly change over time, making the perceived need for change less, resulting in less motivation to initiate a change, which leads to lower overall growth. 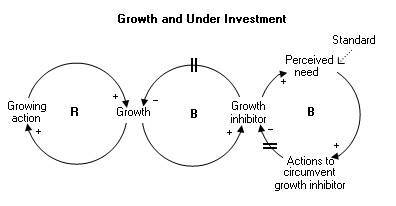 Strategy: The same strategies as Growth and Under Investment apply, but it's also necessary to ensure that the growth inhibitor isn't a factor in developing the standard. In other words, the standard should be based on objectives that aren't tied to the lower goals caused by the inhibiting factor. L von Bertalanffy. (1967). General systems theory: Foundations, developments, applications. George Braziller Inc., New York, NY. Senge, Peter. (1990). The fifth dimension. Century Business: London. Senge, Peter M.; Kleiner, Art; and Roberts, Charlotte. (1994). The fifth discipline field book. Nicholas Brealey Publishing, London. J. Alex Sherrer has been in the information technology field for more than 20 years as a manager, portfolio and project manager, business analyst, software developer, technical writer and trainer. He's passionate about reading, learning, and writing and he enjoys discussing innovation, continuous improvement, organisational theories and technology topics with others. 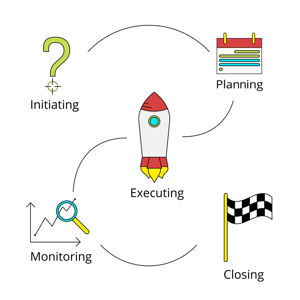 A project plan is more than just a Gantt chart, but do you know what you must have in your plan? This article takes you through the ten essential elements.